Price: The majority of tokens are transferred to SocialGood Cashback service users free of charge. However, a portion of the tokens are sold for a fee. If purchased for a fee, the selling price and conditions for each token can be confirmed at the time of purchase. 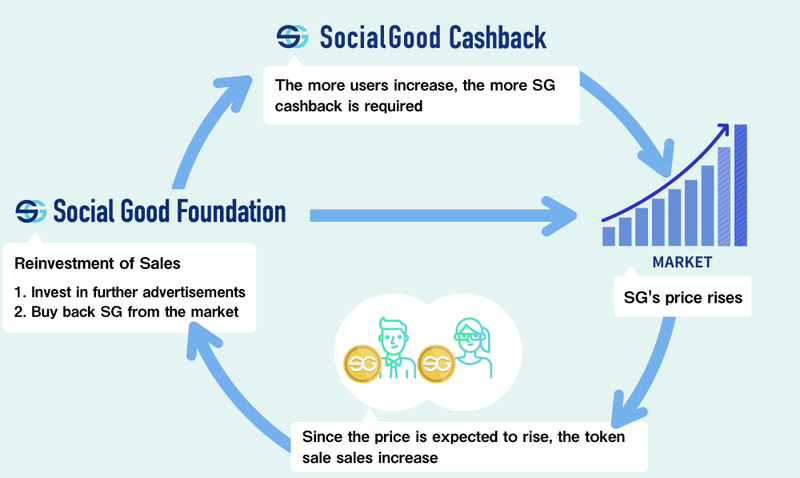 SocialGood (hereinafter referred to “SG”) is a cryptocurrency (token) that, because it has a fixed upper limit of tokens that can be issued, works as a mechanism at which the price rises as the demand increases. This is illustrated in the following diagram. 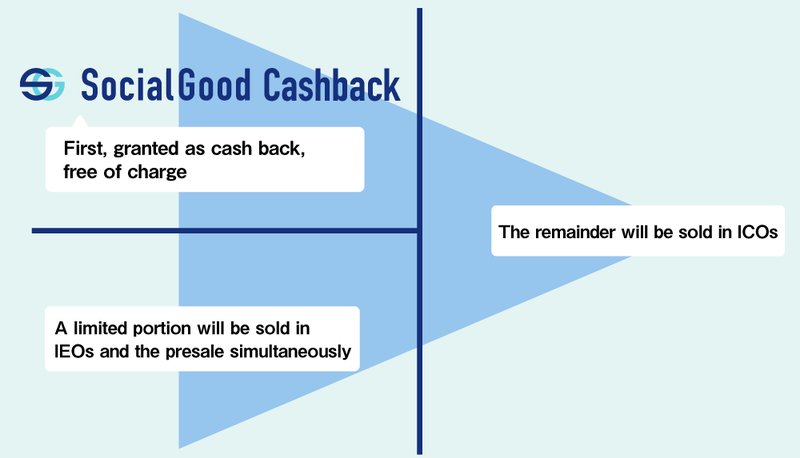 First of all, when purchasing goods, the more SocialGood Cashback users (hereinafter referred to as “user”) whom receive 20% cash back increases, the more the demand of SG used for cash back increases, which makes the SG price inclined to rise. The cash back operating company Social Good Foundation Inc. and Social Good Foundation Malta Ltd., which is the entity that issues tokens, (hereinafter, when referencing both companies combined, will be referred to as "operators"), will sell SG during token sales to wise investors who have taken an interest in the mechanism. The operator uses funds obtained by sales as follows. To conduct advertising etc., to increase user numbers and get higher gross market values, and to increase the amount of cashback. 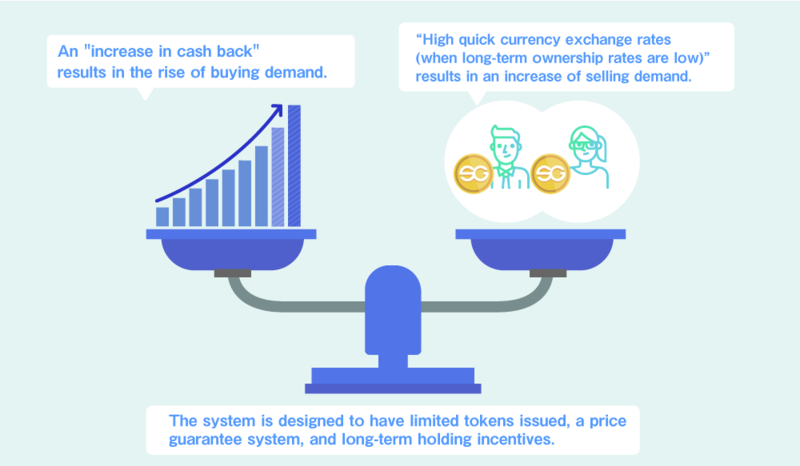 Furthermore, operators provide users with long-term ownership incentives because the longer the holding period of SG is, the higher the percentage of cash back is, urging users to refrain from selling SG. Also, we guarantee users a flat market buying price of SG received in cash back (e.g., 1 SG = 10 dollars) (conditions of the purchase guarantee can be confirmed in the terms of usage and terms of service of SocialGood Cashback). We have already submitted patent applications internationally for the abovementioned token cash back business model. The upper limit of tokens to be issued is 210,000,000 tokens, so when the token ecosystem expands and more SG becomes necessary due to cash back demand, they will be newly issued from the perspective of what will be needed within the next 30 years, but at this present time we have not planned to issue any more. First of all, 17% of the issued tokens (as of the end of 2019) are to be allocated to "teams and partners (alliance companies)". Tokens allocated to "team and partners" are locked up, and then later released evenly every year over the period of 4 years after the token sales have ended. Next, 26% of the tokens issued shall be allocated to institutional investor sales and the Airdrop distributions that were implemented in 2018. Finally, 10,000,000 tokens corresponding to 56% of the issued tokens will be applied, in accordance to the schedule token distribution for 2019, to the tokens used for cash back during the 2019 fiscal year and for the token sale in 2019. In regards to this allocation, at the end of December 2019, when the tokens are to be listed, we will issue a maximum of 17,727,258.9181 tokens, without including the allotment to the team and partners, and the maximum tokens in circulation will be 14,627,258.9181 tokens, accounting for 83% of the issued tokens. In the 2019 fiscal year, up to 10 million tokens will be distributed before listing. The process is as follows. First of all, since February 2019, as a part of the SocialGood Cashback service, we will grant SG up to or the equivalent of 20% of the purchased goods made by users who purchase goods at alliance companies free of charge (for details, please check the terms of service of SocialGood Cashback). Next, between February 2019 and until the listing date (scheduled for 2019), SG tokens will be sold for a fee during a sale carried out on cryptocurrency exchanges (each corresponding sale hereinafter referred to as an “IEO”). Another portion will be sold on the issuer's site (hereinafter referred to as “presale”). For terms and conditions of the token sale, etc., please confirm the sales conditions for each token at the time of purchase. December 2019, we will sell tokens in various cryptocurrency exchanges worldwide (each corresponding sale hereinafter referred to as an “ICO”). In other words, cash back users are granted SG free of charge, and the remainder will be sold during the presale, IEOs and ICOs for a fee. In addition, of the 10,000,000 tokens to be distributed within the 2019 time frame, if there are any tokens left over that were not provided as cash back free of charge or were not sold at a fee, they will be allotted to the operator as token inventory for future cash back distributions. A breakdown of the usage of funds obtained through the token sales held during the 2018 and 2019 fiscal years are as follows. “Ecosystem Expansion Expenditures” mainly expand the SocialGood Ecosystem ™ and increase the asset value of SG owners. In order to do this, allocated funds are used in the following three ways. For details, please refer to abovementioned "Token Ecosystem Mechanism."